In September of 2012, I got an e-mail from veteran writer and game designer Chris Avellone. He told me that he and a group of other designers at Obsidian were planning to launch a Kickstarter, and that they were looking to make an RPG in the style of old Infinity Engine games like Baldur's Gate and Planescape: Torment. Would I be interested in hearing more? "Hell yes," I said. Those isometric RPGs are some of my favorite games ever, and to this day, Baldur's Gate II remains on top of my GOAT list. Clearly I wasn't the only one who felt that way: fans would up giving a whopping $4 million to what was then called Project Eternity. 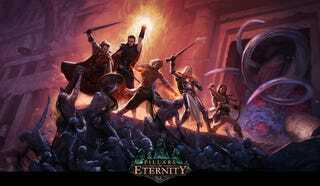 Almost two years later, Obsidian's Pillars of Eternity is now a real game. I saw it last week in a closed-door session at E3, and what was once a bunch of promises and papers now appears to be a worthy successor to the old computer role-playing games that so many of us loved back in the day. In fact, if Pillars of Eternity lives up to expectations, I imagine people will spend a lot of time calling it things like The Baldur's Gate II Sequel We Never Got and The Next Great Computer RPG. From what I've seen so far—which, admittedly, isn't very much—it seems to meet those standards. The D&D stuff is all gone, but that feeling of top-down isometric exploration and adventure is way intact. This game looks exactly like Baldur's Gate, from the slanted isometric view to the green and red circles around characters' feet. Hell, even the cursor seems straight out of the Infinity Engine. But without the trappings of D&D, the folks at Obsidian were able to create their own lore, ditching the liches and half-orcs for a world full of enemy species with names like Glanfathan and Skuldr. Someone had a lot of fun coming up with this stuff. There are eleven character classes. Any character can equip any item, but some classes will handle those items better than others. Combat feels a lot like Baldur's Gate, too. It's real-time, but you can pause whenever you'd like to take a breather and give commands to your party. One big difference: instead of D&D-style "turns," characters have turn gauges that charge up in real time, not unlike the ATB system in Final Fantasy. Also, you can't just rest after every battle like you could in the old Infinity games—in Pillars, you can either rest in an inn, or rest outside with camping supplies, which are limited based on the difficulty you choose. "We don't want the player to rest after every combat," said producer Adam Brennecke. "We want the player to think a bit more." As the game starts, your player-character is on a caravan to something called the Gilded Vale. Your guy or gal falls sick, and the caravan has to stop for the night. Things do not go as expected. I won't spoil everything that happens in the demo, but the folks at Obsidian like talking about how encounters will have multiple solutions, both on a macro and micro level. At one point, for example, you're approached by a sickly enemy, and you can decide between killing him, trying to talk him out of fighting, feeding him, and other options. In the bigger-picture, the first dungeon lets you decide whether to solve a giant floor puzzle or find an alternative route. As you interact with people in the world of Pillars, you can develop a reputation for yourself. It goes way beyond good and evil—we saw a dialogue tree in which the PC could increase traits like Honest, Diplomatic, Passionate, and Rational. Presumably some characters will treat you differently depending on how the world perceives you. They're still targeting late 2014 for release. I asked Brennecke if he was concerned about launching close to Dragon Age: Inquisition, the big-budget BioWare RPG that's out in October. He said he wasn't worried—different audiences. Though the first Dragon Age felt in some ways like a new Baldur's Gate, BioWare's games have evolved in a totally different direction. Pillars is going back to those BG-style roots. I also asked why the camera was so close up on the characters in the demo, and he showed us that you can zoom in and out, which is one of those killer, underrated features that will make this game much more convenient than any Infinity Engine RPG. In the demo, we got to see one of the coolest unique features Pillars has to offer: illustrated text adventures. See, instead of CGI cut-scenes, Pillars breaks up the questing and dungeon-exploring with interstitial text sequences that could be straight out of a Choose-Your-Own-Adventure book. You get to make tough choices as you read through them. These scenes are really cool, and if they're written well, they'll be a game highlight. That's Pillars of Eternity. It was one of the best things I saw at E3 last week, and hopefully it'll make us forget we never got that Baldur's Gate III.